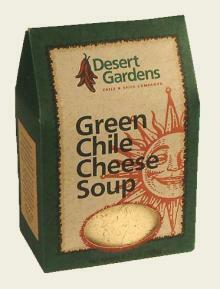 Green chiles, cheddar and Romano cheeses, onion, garlic and more all go into this marvelous Mexican style soup mix – add water, simmer and enjoy with any one our Desert Gardens Cornbreads! Rice, Cheddar Cheese, Romano Cheese, Green Chile, Onion, Garlic, Modified Food Starch, Broccoli, Corn Syrup Solids, Partially Hydrogenated Soybean Oil, Sodium Caseinate (Milk Derivative), Dispotassium Phosphate, Mono and Diglycerides, Sodium Aluminosilicate, Spices, Artifical Flavor and Color. Add contents to 5 cups (40oz.) warm water. Stir and bring to a boil. Simmer covered for 20 minutes. 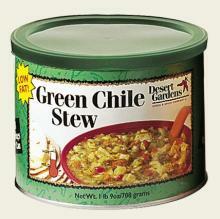 I decided to try the green chili soup because I love the green chili seasoning so much. 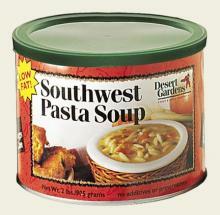 It is very good, has a nice cheesy flavor without very much fat so it’s a win win. It has a little bit of rice in it so it is very hearty, I enjoyed it. 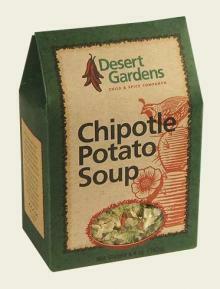 When I tasted it my very 1st thought was, this would make awesome enchiladas! Reduce the water and you have a creamy rich sauce for some great chicken enchiladas.